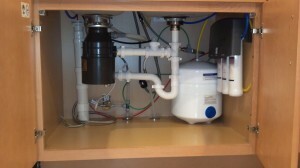 This is a recent install of a reverse osmosis water filter system and a new Garbage disposal. We can install all types of water filter systems in your home, from under sink to whole home systems. We can replace or add garbage disposals to most sinks quickly and with out a great deal of plumbing modifications. Call us for a free quote and get great tasting water for much cheaper than purchasing bottled water. This entry was posted in Garbage Disposal Installs & Replacements., Water Filtration Systems and tagged knoxville plumbers, knoxville water filtration. Bookmark the permalink.